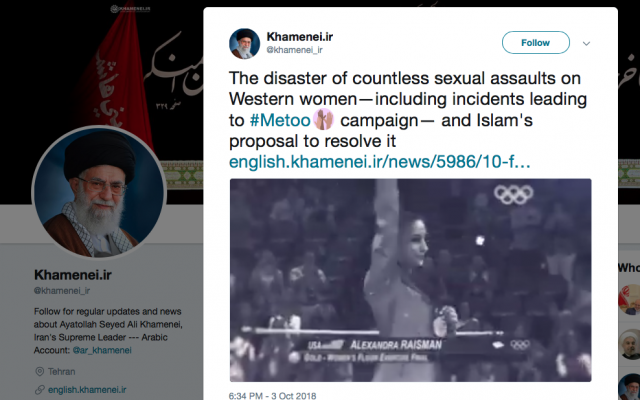 Iran’s supreme leader, Ali Khamenei, has a solution for all the #MeToo angst — the hijab. The video he attaches to the tweet below runs through a number of prominent American women describing their experience of assault. Aly Raisman, the Olympic gold medal-winning gymnast, is shown at the start of the 2-minute video. The clip then segues into her testimony at the sentencing of the Olympic team doctor, Larry Nassar, who molested dozens of women and girls. 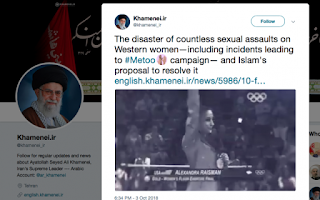 After that, Khamenei is shown speaking about how wearing a hijab can protect women from “deviation” (translation: getting assaulted) and how Islam does not allow sexual abuse or violence against women….